Since i bought these lipsticks i have been asked a few questions about how long they last, how matte the appearance is, the colour's etc, so i thought i would review them today for you! I bought two of the Rimmel Lasting Finish Matte collection by Kate Moss for £4 each on promotion in ASDA, i'm not sure if this is ongoing but you can pick them up from Boots, Superdrug etc for around £5.49 each. I picked up the lipsticks in shade 107 and 110. I'll start on 110! 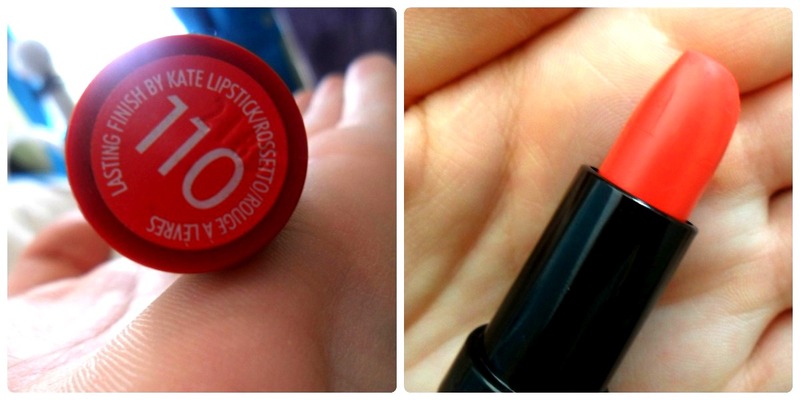 So this lipstick is a bight red colour despite it looking quite orange in the picture (it's definitely red!). I loved this as soon as i seen it as i love love love matte lips and i love red lipstick on anyone! It's a simple colour and can really add a pop to a plain outfit. Here's a swatch of the colour on a lovely close up of my hand! It was hard to get a picture of this on myself as the lighting today is really awful but i tried, so here are a couple (excusing my minimal 'work appropriate' makeup look!).. Doesn't really match the dress does it? It looks a bit brighter in the pictures due to my flash i had to use because of the lighting, but i think they show how more red it is than orange. I love the colour and having worn it yesterday for around 5/6 hours baring in mind i had drank coffee, been outside all day and eaten lunch, i would say it's staying power is pretty good! Anyway, i also love it in shade 107! This one is more of a winey sort of reddish purple (great description skills Ash!) colour. I picked this shade up before shade 110 and decided that i have enough reds and just to get this one instead.. but nope, i just got both! I decided to swatch and put this one on for you guys to see too :)..
As you can see it is more of a wine colour sort of in-between a red and a purple. 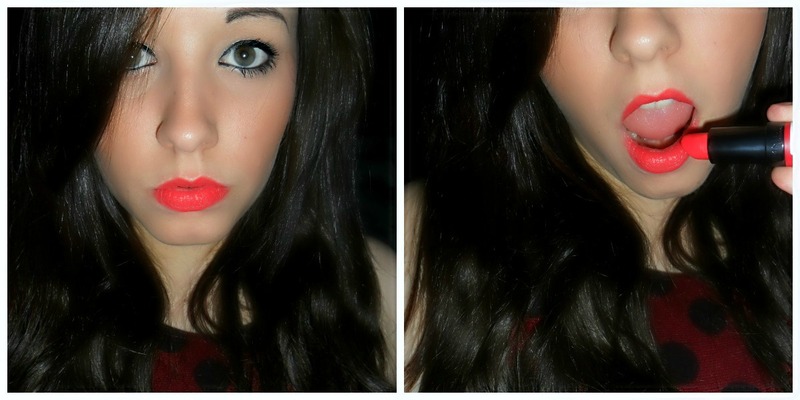 I also took some pretty rubbish photos of it on the lips and me doing crazy faces..
Matches the dress much better! I have to say, despite me being an avid red fan, this is quickly becoming my new favorite lipstick. It takes a while to dry into the lips and become a bit more smudge proof but it is a really pretty matte colour and really looks lovely on. Obviously in the middle picture i don't have the lipstick on.. i was mid-application but thought it would be a good picture to show contrast between my actual lips and the lipstick. 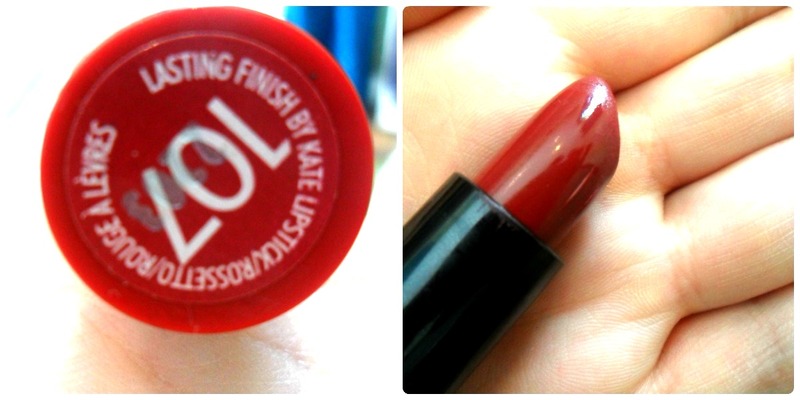 Overall, i love the Matte collection by Kate Moss and i probably will buy one or more of the other available colours. I plan to compare these to the original Lasting Finish by Kate Moss lipsticks but, i already know i prefer the Matte ones just because i really love the finish. I know matte lips are not every one's cup of tea though! I will say that i feel they are a tiny bit drying on the lips but not excessively so and you can use a balm under them, it will just mean they may not look as matte. Also, the smell of these is really really nice for a lipstick. I don't really know how to describe it but they smell almost fruity? Not sure, but it's really nice in my opinion! I am going to wear one of these over the weekend for a whole day and see how long they last without any reapplication. I will take photos (better ones in natural light!) and keep you updated! Do you own any of the Rimmel Lasting Finish Matte collection? Do you love them as much as me, or am i the only fan? This shade looks sick on you girl! :) I love Rimmel Lipsticks. Thank-you very much :). Me too! I've entered babe, great giveaway! You pull of this colour lipstick so well, such a great look on you! Really like 110 on you! Totally fierce. Aw i might have to try out 113! I LOVE IT!!!!!!! Esp the first one. Yeah, i think it looks great on you! They are, i love them too!